Health care organizations have unique requirements for their print environments. As technologically advanced as they are in terms of record keeping and information sharing, they still rely on a great deal of printed paperwork and documentation, which demands incredibly high availability and reliability of their enterprise print services. Their organizations are often distributed over multiple sites in order to have a presence in customers’ local communities, so they tend to make use of remote management and support. And to keep prices low for their customers in an inherently expensive industry, they also have a keen eye for cost reduction. They stay lean by implementing operational efficiencies and optimizations wherever possible. Close to half of these health care organizations said that PrinterLogic slashed the time they spent on print management by 70% or more. To put that in perspective, for every hour they had been spending on print management prior to installing PrinterLogic, they now spent 18 minutes. Just think of how much saved time and increased productivity that would equate to each week. And 71% of the organizations surveyed said that PrinterLogic cut the time spent on print management by more than half. 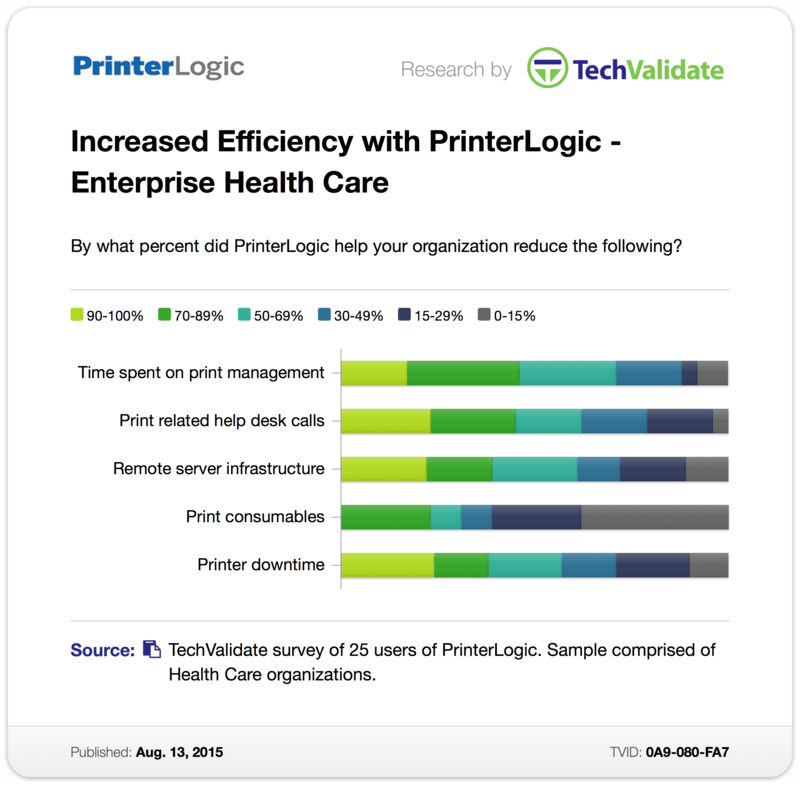 Speaking of 50% reductions, more than 60% of these health care organizations said that PrinterLogic did the same for the number of print-related service desk calls. When it came to slimming the remote server infrastructure, nearly three-quarters of the organizations said that PrinterLogic helped them achieve this to the tune of 30% or more. In fact, a full 22% reported that installing PrinterLogic enabled them to shed an astounding 90% or more of their remote server infrastructure. An unexpected strength of PrinterLogic is its ability to track and address usage of consumables (e.g., paper, toner) through comprehensive auditing features. Almost 40% of these health care respondents found that they were able to target and reduce consumables usage throughout their organizations by more than 30%—with close to one-quarter of them succeeding in enterprise-wide reductions between 70 and 89%. That represents massive savings they can now use to satisfy existing customers and attract new ones. But one of the most stunning results of the survey was the reduction in printer downtime. Nearly 25% reported reductions of 90% or more! For these organizations, one hour of downtime before PrinterLogic is now just six minutes at most, ensuring that employees have access to print services when they need it. Well over one-third said they had experienced reductions in printer downtime of 70% or more since installing PrinterLogic; just under three-quarters reported reductions of more than 30%. What do all these numbers add up to? They show that, while health care organizations might have unique printing requirements, they’ve found PrinterLogic to deliver indisputably spectacular results across key areas in real-world use.